To tell the truth, Croatia is not among top climbing destinations in the world. Croatians are not famed to be ‘the mountaineering nation’, as some of our alpine neighbours surely are, though we do have beautiful mountains. Luckily, one piece of a perfect limestone crag recently started to change our climbing reputation. Year by year, as Croatia is embracing some fresh concepts of tourism – adventure and outdoor tourism, to be precise – three hundred and fifty meters high, bigwall of Anića Kuk in National park of Paklenica, is becoming more and more popular within the climbing circles, not only in Europe, but worldwide. 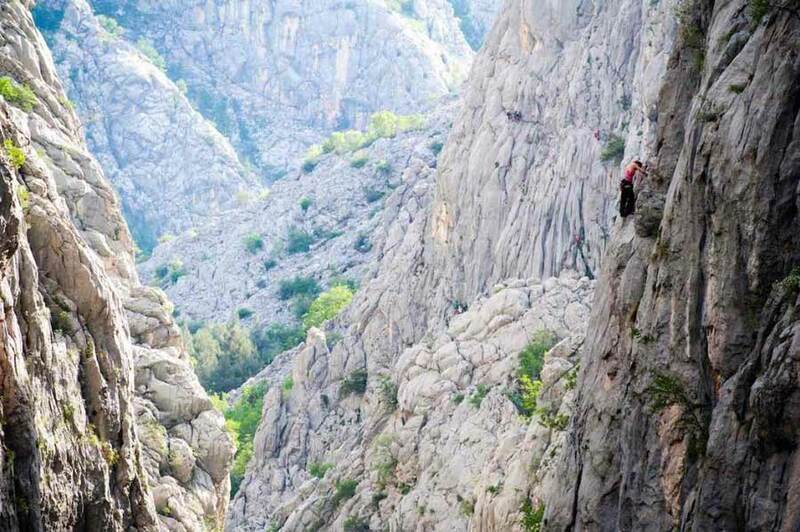 There are several reasons why Paklenica attracts climbers. Most notably – it’s the solidness of the rock. White Mediterranean limestone, because it’s so close to the sea, is filled with salt from the coastal air and gazed with the sunlight most of the days in a year. This combination makes the rock pretty solid so climbers can trust almost every existing hold and simply enjoy the beauty of movements. Secondly, Paklenica is offering more then 450 routes of all grades and styles, from basic sport routes to a complex multipitches, from overhanging to big wall. From sport climbing to technical to trad climbing. The whole climbing area, every single route, is constantly supervised over the course of the year and the park staff – the rangers – are always there to help and protect the guests of the park. Third, Paklenica is a perfect place for your adventure holidays. Situated by the Adriatic sea, it’s the spot for almost any combination of water sports and outdoor activities. You can go surfing, seakayaking or diving in the morning, then go trekking, hiking or climbing in the afternoon. Or any other combination you can think of. Furthermore, most of the routes are easy to acces – some of the routes start at the very parking lot – and wide range of grades, makes Paklenica even more interesting for families with little children. Or the beginners, to say so. You can rent a climbing equipment at almost any hour and experienced climbing guides are just waiting for someone brave enough to take the adventure that most people would call the adventure of their lives. 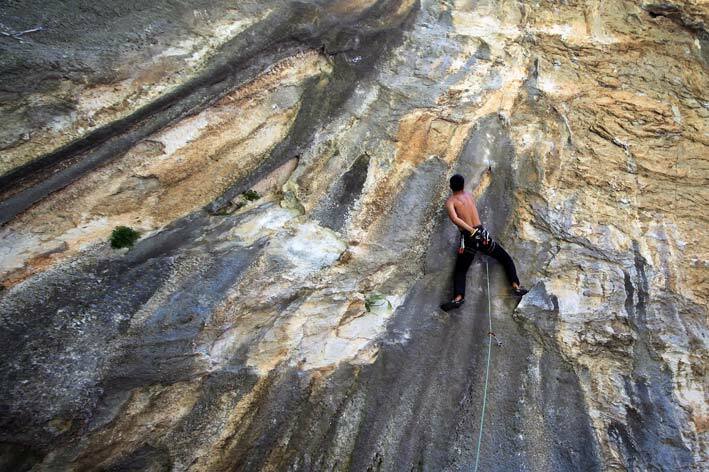 But Paklenica is not the only crag along the Dalmatian coast to combine sport climbing with multipitches. If you travel further to the south, you can find a similar conditions in the climbing area surrounding the city of Omiš or the mountain of Biokovo. The crag over the city of Omiš was always attracting local climbers. There is a rumour that every Dalmatian trad climber has at least one first accent in those rocks. But somehow, Omiš as a climbing area has not gained so much popularity as Paklenica did. And that’s a pitty because those rocks are rising from the city itself so the ambient is quite out-of-this-world. 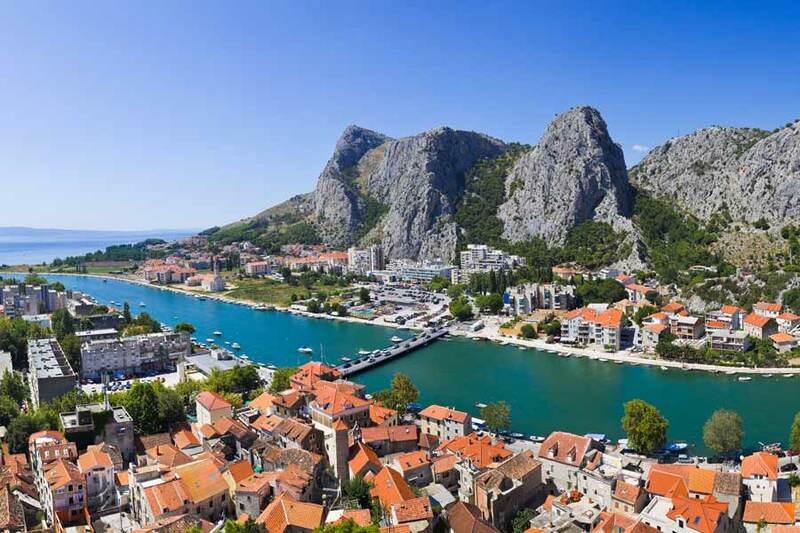 Over the last decade, as more and more sport routes has been bolted in the area, Omiš finally started to gain interest among the adventure-oriented tourists. As well as the mountain of Biokovo, further down the south. But, unlike the Omiš crag, Biokovo offers wilderness. Biokovo is the mountain that literally dives into the sea and the whole southwestern side of it, the one that fronts the Adriatic, is a bare limestone rock. So, the views from the routes are breathtaking. There are more then 200 routes at Biokovo, most of them from 300 to 600 meters long and if the climbing statistics is of any value for you, Biokovo offers the longest climbing route in Croatia. So much for the multipitches. For those interested in sport climbing exclusively, Croatia has even more to offer. Ever since the nineties, there hasn’t been a single season here in Croatia, that some new crag wasn’t equiped for free climbing. Seems like potential is anywhere you turn. And while in some of the crags there are only a few bolted routes, in some others there are dozens of them. So, right now there must be over fifty well equiped crags around Croatia, but in order to narrow it down, we’ll emphasize just two of them, two crags which are gaining the most popularity in recent years. Kompanj is a crag situated in the central Istria. Because of the quality of the rock, great positioning and good weather conditions during the whole year, Kompanj is becoming the most popular sport climbing crag in Croatia. It all started in 2007. when Austrian climber Leo Baumgartner and his friends started visiting crags around the town of Buzet. Pretty soon, they acknowledged the potential of a crag rising over the town of Roč – área known as Kompanj – and started bolting. It didn’t take long for technical diversity of routes to attract Croatian, Slovenian, Italian and Austrian climbers and they all started visiting this área continually. 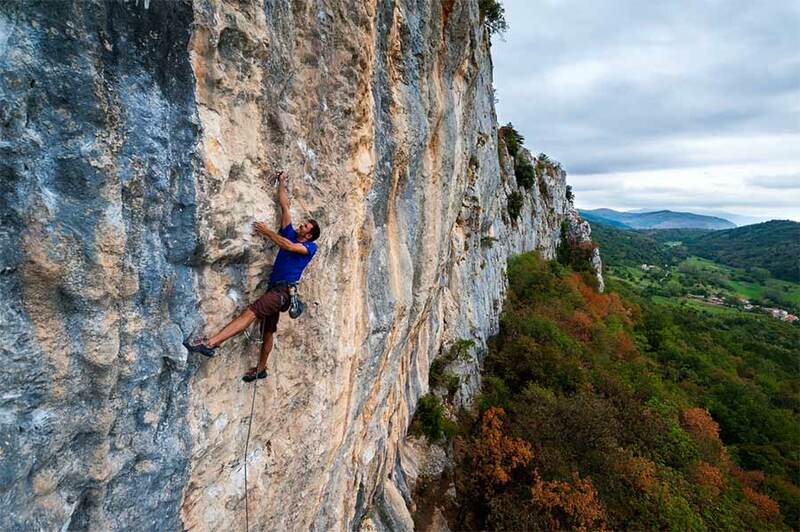 Local authorities also recognized the potential of investing in local outdoor tourism so they started financing and editing the whole climbing área around Buzet. The result is – more and more climbers and visitors every year. And experience of climbing in Kompanj is really far out. Even though we emphasized Kompanj as the most popular climbing crag in Istria, it’s well worth mentioning that the whole Istrian península is pervaded with crags, all equiped for free climbing and that it would take time to describe them all. Let’s just say that any average climber can spend an entire month just climbing the crags around Istria and she wouldn’t have time to climb all there is to climb. The same can be said for the island of Hvar. Croatians are very proud of their islands. There are more then thousand islands along the coast. Many of those are excellent vacation destinations. But one island really deserves to take the crown – Hvar. Among the islands, Hvar is the most popular one. A destination in line with Dubrovnik or Split. It’s perfect for party people, perfect for eno-gastro people, perfect for ancient-ambient people. And ofcourse – perfect for adventure people. And we are not talking just about climbing here, but for the purpose of this blog, let’s stick with climbing. 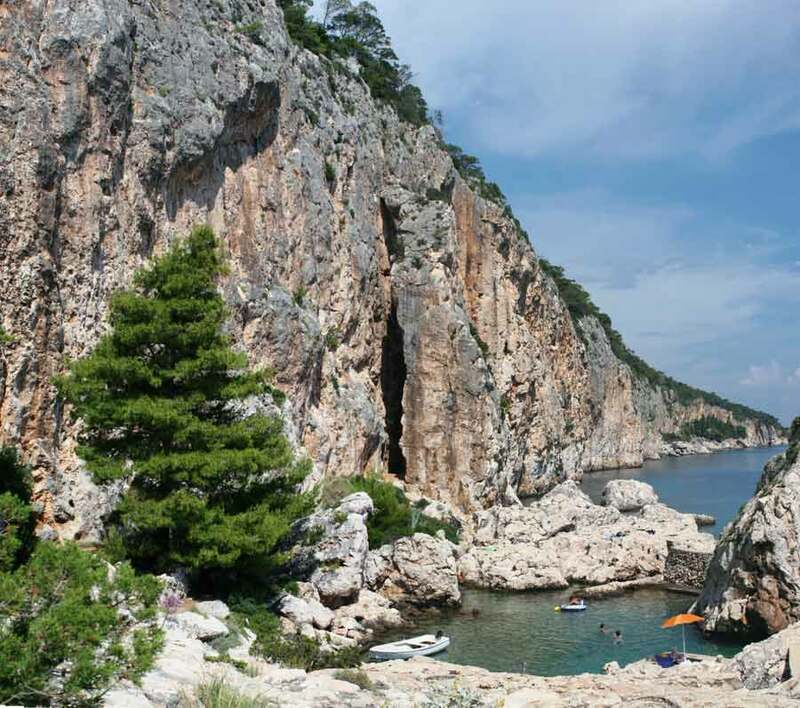 There are six crags equiped for free climbing there on Hvar. This number might appear small to some, but believe us the number of bolted routes is not. For example, the most popular climbing spot on the island is the crag nearby little village Sv. Nedjelja (Saint Sunday ☺). It is the most popular spot for a good reason, because the rocks are rising right from the beautiful beach and some of the routs are just above the sea. So, there in Sv. Nedjelja spot there are over 120 bolted sport routes of all difficulties. Considering the ambient (the laguna heading south) one could stay there for days and days just climbing and chillin’. And this one is not the only super-crag on island. The other one is Stiniva. It is also situated nearby the sea, in a little cove by the same name – Stiniva. Advantage of Stiniva crag is that there are two seperated climbing sectors – one for moderate and hard climbing and the other one for easy climbing. So the beginners and experienced climbers don’t stay in each other’s way. Also, the number of the routes all together is more then seventy. Podstine is a crag nearby the city of Hvar and since most of the guests on the island are accomodated in the city of Hvar, this spot is often the guest’s choice. As a matter of fact, you can walk right to it. And even a walk is quite an adventure. When you reach the spot you will find around twenty routes completely equipped for free climbing and potential for many many more. Other crags on Island are all recently developed for climbing and are the work-in-progress, so we won’t bother any further about it. But all above mentioned, we believe, is more then enough to make Hvar as your climbing-vacation-spot closer to you. And we’ll stop right here. This is just enough. If you are interested in more information where to climb in Croatia, feel free to contact us directly and we can talk about it for hours and hours. Untill then, stay strong!